Large shrub-like with trunk 3-10' . Very drought, heat, & sun tolerant. Rosette stiff & usually single headed with several rosettes. Lvs 1" wide & up to 4' long & dull blue-green-gray green. Marginal leaf filaments. Smooth margin. Flowers cream color & small. 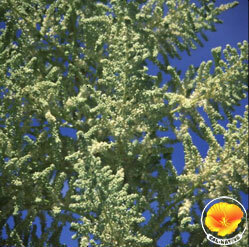 Native in very xeric areas Az & Calif. Probably most drought tolerant. Full sun. Some additional water in summer. Good choice for mixing with agaves, yuccas, cacti & other desert plants. Flwr May-June. Dry rocky slopes <3500 w Az.